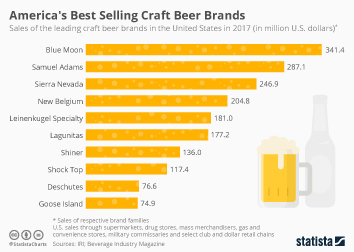 In 2015, beer-producing companies took four of the top ten spots in a ranking of the top-selling companies in the global beverage market. Heineken N.V., Diageo and SABMiller PLC ranked fifth, sixth and eighth, respectively, on this list. Diageo is the multi-national alcoholic drinks manufacturer responsible for producing Guinness, the beloved Irish dry stout from Dublin known for its trademark “double-pour” technique. In 2016, Guinness had a recorded brand value of 4.6 billion U.S. dollars. In a ranking of leading beer companies worldwide in 2015, Heineken Holding ranked second in sales. Heineken International is a Dutch brewing company. Their headquarters is in Amsterdam and they produce over 170 different types of beer around the world. In the spring of 2015, some 10.04 million people in the United States responded that they had recently consumed a Heineken beer. SABMiller is a British brewing and beverage company responsible for the production of many popular beer brands worldwide, including Foster’s Lager in Australia, Pilsner Urquell in the Czech Republic, and Miller Brewing Company in the U.S. In 2016, SABMiller's sales volume of lager in Africa exceeded 50 thousand hectoliters. More interesting topics from the industry "Beer"